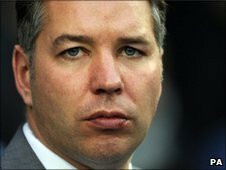 Preston North End have sacked manager Darren Ferguson with the club bottom of the Championship table. The former Peterborough boss, 38, took charge at Deepdale in January, but won only 13 of his 49 games in charge. A statement on the club website read: "The club expressed their appreciation of the efforts made by Darren. "We felt that the league position represented a significant threat to the club and it was felt that a change of manager might bring better fortune." Ferguson's last game in charge at Deepdale was a 3-1 defeat by Middlesbrough on Tuesday and Preston sit five points adrift of 21st-placed Boro in the table. The Scot enjoyed major success in his first two full seasons as Peterborough boss, leading them to back-to-back promotions to the Championship but left by mutual consent in November 2009 with them propping up the table. He took over North End following the departure of Alan Irvine, who was sacked exactly one year ago, with the Lilywhites 16th and they finished the season one position lower. The sacking comes less than two hours after Brian Laws was shown the door by Lancashire neighbours Burnley.